When I was 12 years old, my love for anime was at its peak. I had a box set of Miyazaki’s seven masterpieces*, which I had watched countless times. I memorized the names of each character in those films, and more embarrassingly, before falling asleep at night, I would wish each and every one of them goodnight, in hopes that I would dream up adventures about them. But oh no, I would not stop there. My biggest goal when I was 12, aside from self-publishing my terrible novel, was collecting every Studio Ghibli or Studio Ghibil-related anime movie I could find. I snagged copies of My Neighbors the Yamadas, Grave of the Fireflies, and The Cat Returns… which, consequently, led to my next find and one of my favorite films, Whisper of the Heart. Whisper of the Heart is viewed as a spiritual prequel to The Cat Returns, thanks to the cameo appearance of the latter film’s side character, the Baron. The film focuses on 14 year old Shizuku, who becomes inspired by the Baron and writes a novel about his fantastical adventures. 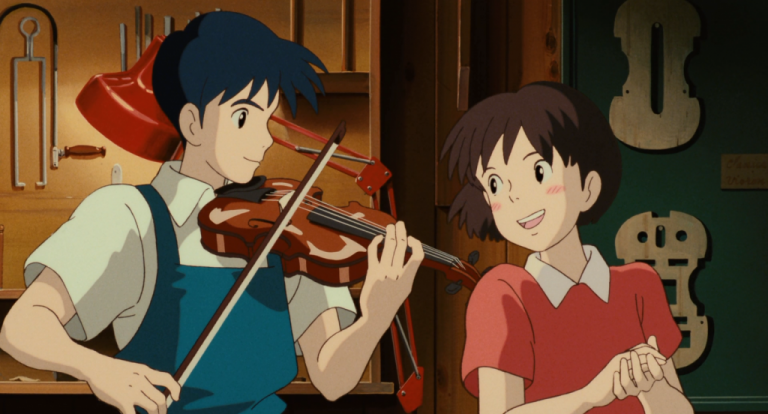 Whisper of the Heart is a coming of age story about pursuing your dreams and a romance. It touched my angsty pre-teen soul deeply. I still remember the opening moments of the film. It starts on a black screen. Suddenly, the deep, joyous rumbling of a choir erupts as the glittering Tokyo nightscape fades into focus. The camera pans down to look at the river that splits the metropolis in two. A bullet train glides across the water; its warm yellow lights reflecting on the navy blue waves below. It’s almost like the opening scene, with its accompanying music, is a love letter to the town of Seiseki-Sakuragaoka, which neighbors the mighty Tokyo. The cityscape of Tokyo sharply contrasts with the surrounding farmlands and vintage architecture of the older neighborhoods in Seseki. Without holding a breath, the opening draws us in all at once. What would seem so plain and ordinary in reality becomes both warmly familiar and magical to the viewer. The song, Take Me Home, Country Roads, is a recurring motif in the film. Shizuku translates a version of the song to sing for graduation, freestyles a parody, and later sings the song while a bunch of other characters play along with their instruments. Another version of the song even plays during the ending credits. When I came away from the film, I thought, What IS that song? That incredible song? A quick Google search later, and I found that it was actually a song by an American country musician, John Denver**. I pulled up the original version on YouTube, listened to it, and once again, fell absolutely in love with the melody. Here you might be thinking, Why would a Japanese children’s film be so focused on an American country song? And that, dear reader, is a fantastic question. John Denver was one of the most popular acoustic artists of the 1970s, as well as a well-known activist and humanitarian. His influence actually spread to other countries, and he performed abroad multiple times. Most notably, in Japan. He actually collaborated with one of Japan’s most notable musicians, Kosetsu Minami, multiple times. Collectively, Whisper of the Heart and John Denver’s music guided me through the rocky years of early adolescence. The imagery in the film as well as in the music’s lyrics became a comfort to me. While Shizuku is struggling so hard to fulfill her dreams, she finds solace in the song. At that time, I saw a lot of myself in her: a girl who never thought she’d be good enough; who never thought that the effort she put in her writing would amount to anything. And although Shizuku had supportive friends and family, they didn’t seem to understand her obsession with her passion–and why she became so depressed when she hit writer’s block. Like Shizuku, I was frustrated because I thought that my family and friends could not understand why my goals were so important to me. In my mind, the song served as a reminder that Shizuku would, in time, find her place in this world. It soothed her anxiety about never being good enough. She would forge her own path, even if it was as dusty and bumpy as an unkept country road. She would one day reach her destination and she would find where she belonged. The song uplifted her spirit when she was down, and motivated her to keep going. John Denver’s music motivated me as well. Although I’m an adult, I’ve learned that that anxiety of failure doesn’t fade away completely. As I struggle to finish my first graphic novel, and tackle the basics of my first video game, I find the possibilities of my failures overwhelming. Like Shizuku, I find myself frustrated at the fact that I haven’t accomplished my goals yet. This week I’ve spent multiple nights in front of my computer, wondering when I will see the fruit of my efforts, and finally be able to set down my Bamboo pen. But last night, when I was sitting on a bus in the middle of early-evening traffic, watching the rosy sunset fall over the city skyline, I was reminded of that opening segment from Whisper of the Heart. It was like I could hear the song all over again. And my fears, in that moment, subsided. * For those of you who are wondering, the boxed set included Howl’s Moving Castle, Spirited Away, My Neighbor Totoro, Nausicaä: Of the Valley of the Wind, Kiki’s Delivery Service, Castle In the Sky, and Princess Mononoke. ** I didn’t learn until now that the version of the song that was used in the opening credits was done by Olivia Newton John. Glad I found out, because I never would have guessed that.